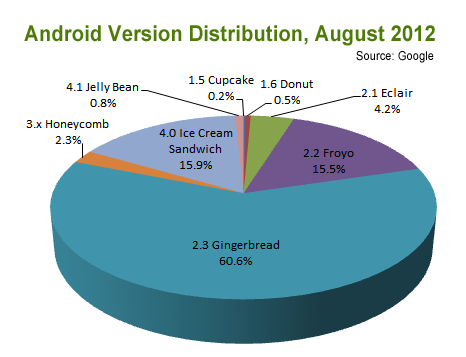 Google's unofficial codename for Android 4.0 is "Ice Cream Sandwich" (ICS), but it may as well have called it Godot, as the latest market figures yet again demonstrate. According to the most recent Android Developer Dashboard numbers, which were compiled by polling Android devices during the two weeks leading up to August 1, ICS is now running on a record number of devices, but its overall penetration is just 15.9 per cent. We could be kind and point out that this represents a 46 per cent bump from July's numbers, when ICS only held 10.9 per cent of the market. But that seems charitable when you consider that Google released ICS nearly a year ago. What's truly disappointing is that the lion's share of Googly handsets – roughly 61 per cent of the total – are still running Android 2.3, codenamed "Gingerbread," a version that dates back to 2010. Around the time ICS shipped, Android product manager Gabe Cohen said that the upgrade to 4.0 "theoretically should work for any 2.3 device." Almost a year later, the majority of Android users are still waiting. How much of the blame for that should go to Google and how much to the handset manufacturers is hard to say. Clearly some mobile makers have struggled to get ICS working on their devices, and many announced upgrades have been delayed. It seems likely that most of the uptick in ICS market share can be attributed to sales of newer, high-end handsets, such as the HTC One X and the Samsung Galaxy S III, which ship from the factory with Android 4.0 installed. But while that's all very good, it's the second half of 2012 now and ICS isn't even Google's latest OS anymore. That title goes to Android 4.1, codenamed "Jelly Bean," which was released at its Google I/O developer conference in June. Currently, Jelly Bean accounts for just 0.8 per cent of Android devices – which makes some sense, given that it currently only runs on Galaxy Nexus handsets and the Nexus 7 and Motorola Xoom fondleslabs. By comparison, during the keynote of its Worldwide Developers Conference in June, Apple bragged that more than 80 per cent of iOS devices were running the latest version of its system software, iOS 5. Apple says it plans to release iOS 6 "this fall" – which probably means September – and that all current iOS devices will support the upgrade, going back to the iPhone 3GS, the iPad 2, and the iPod Touch 4. Jelly Bean is only a minor-version upgrade from ICS, which in theory means that most ICS-compatible devices should be able to run it. The trick will be getting vendors to ship it, and given their track record with ICS, that will be no mean feat.